One of the loveliest fancy rabbits, the Silver Rabbit was so valued for its coat that at one point it was known as the Riche Lapin, or Valuable Rabbit, in France! Today this sweet breed makes a docile and friendly pet. The Riche or Silver Rabbit has acquired a reputation among enthusiasts as a sweet and amiable pet. In addition to its beautiful coat, the Silver Rabbit has the personality of a showman! It is shown, quite frequently in fact, as a class four rabbit. The Silver Rabbit has a winning disposition and makes a loving, docile companion. Weighing in at about five pounds, the Silver Rabbit is not actually all silver, but may come in black, brown, or fawn. These rabbits are called Silver Rabbits because of the interspersing of silver hairs throughout the color on the head and ears, chest, and feet. The silver hairs should be bright and sharp, as should the eyes and the ears. The eyes and ears should be neat and clean. Although Silver Rabbits are light boned, they should have firm flesh and the breed standard requires a slightly arched back. 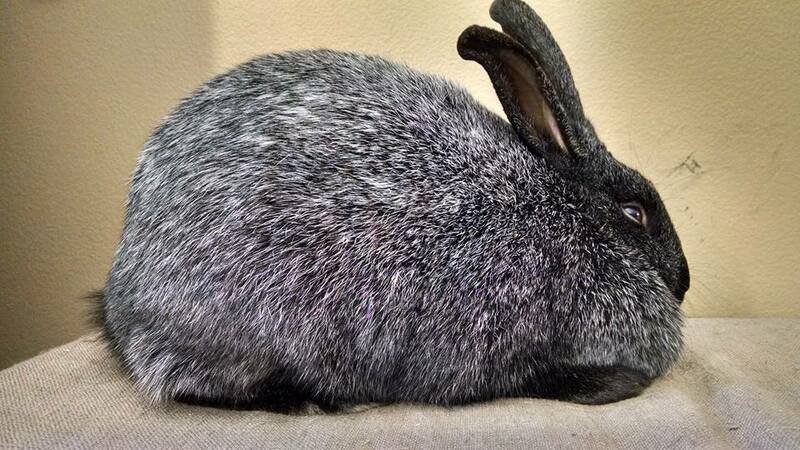 The black variety of the Silver Rabbit is the most popular, and according to breed standard should be very deep and rich with a blue-black undercolor. The undercolor should extend to the skin. In the fawn breed standard, the undercolor should come as close to the skin as possible, and should be orange. Brown Silver Rabbits should be a rich chestnut hue, with the undercolor the same and becoming more blue as it approaches the skin. There is some debate as to whether or not blue is an accepted color. for the silver. The breed standard for blue Silver Rabbits dictates a dark blue coat with an undercolor of the same shade. The topcoat of all Silver Rabbits should be bright and rich and the silver hairs should stand out beautifully in contrast (and compliment!) to it. Thought to have originated in India from the Silver Grey Rabbit, the Silver may actually come from a family tree, which is thousands of years old! It was the Portuguese who first brought the Indian predecessors to Europe, and the English bred a brown version of the Silver Rabbit by crossing their specimens with Belgian rabbits. These light brown Silver Rabbits were crossed with black Silver Rabbits to produce a fawn color, and the French also produced their own fawn version called the Crème Argente. In the 1870’s, the Silver Rabbit fetched an extremely high price for its coat, which was valued for its lovely color and texture. White toenails will disqualify Silver Rabbits in show. Unhealthy animals will be recognized by dull eyes, lack-luster coats, or weight loss. The short fur should be very healthy and the color should be true, as 50 percent of the points allotted to Silver Rabbits in show are judged on color alone.